What happens when life collides with wrestling? My son Beacon was born two weeks early on July 19th, 2014 at 9:01 am. Dad made it just in time. Beacon’s original due date was August 3rd. In preparation for the World Championships, our national team usually chooses a tournament in late July or early August to compete in as a tune-up event. The scheduled competition was the Gold Grand Prix in Baku, Azerbaijan, but the event would fall within the pregnancy two week grace period, when doctors recommended that both parents remain home in preparation for the baby’s arrival. Basically, if I hoped to be present for the birth of my first child, I better stay home. Decisions decisions. There weren’t many other tournaments to choose from, other than the Pan-American Championships in Mexico City, Mexico on July 17th. That should’ve given me plenty of time to train, compete, and make it home to be ready for the baby’s birth. Or at least I thought. After competing on the 17th, I had a long trip back from Mexico to my home in Lincoln, Nebraska. I landed around 8 p.m. on Friday the 18th, very thankful that I had the next couple of weeks of free time to enjoy with Lauren. But at 5:45 a.m. on Saturday morning, eight hours after I arrived home, Lauren’s water broke, and three hours later our first little guy arrived to the world. Wrestling and fatherhood had just avoided a head on collision. To say that balancing these two is a tough job is a definite understatement. During the first two months of Beacon’s life, I spent roughly three weeks with him, as I prepared for the World Championships in Uzbekistan. Being a parent means sacrifice and many times, complete surrender of your own needs to the needs of your family. Not the grudging, or reluctant kind of surrender, but required from you is the joyful, selfless love necessary to maintain a happy home life. Of course there are things that I’ve lost as an athlete, that were once a staple in my training, but you learn to adjust. There were those wonderful afternoon naps between training sessions, that are now spent taking my little guy on walks or rolling around on our living room floor. There were the amazing uninterrupted nights of sleep, that are now spent settling down our little guy when he wants to ditch the crib and sleep between Mom and Dad. The recovery days that I used to spend sleeping in, are now disrupted by a little foot in the face, or Beacon climbing on my head, usually in desperate need of a diaper change. After being married in 2013, the dynamics of my life changed drastically. Two weeks after our wedding, we found out we were pregnant and life has continued to change since then. I recently had a chat with Lee Kemp that was very comforting and gave me tremendous insight to the delicate balance between family and wrestling. Lee was a three-time World Champion at 74 kilograms and a multiple-time NCAA Champion at Wisconsin. Lee told me, when you plan for something, you adjust accordingly, and make the fundamental sacrifices to ensure that your family is well taken care of. As much as we have a passion for wrestling, at this level it is every bit of an occupation. Typical working dads spend time away from their children too. There is the normal work day, which sometimes includes business trips, or even more time at work than we spend training. But being a parent shouldn’t affect their ability to do their job, and to do it well. So why should it affect yours? You do what you have to do, and you can excel at both. It was great advice. There have been plenty of instances throughout my time as a parent, when I’ve had to pray for patience and enough energy to get through a long day. The realism of life is that it’s not easy, it doesn’t ever slow down, and at times it can be chaotic. Throw in a tough day of practice, and it could be a recipe for disaster. If you follow me on social media, the positivity and big smile on my son’s face in pictures is not always a realistic depiction of everyday life. Those are just the highlights. It’s like watching the ESPN Top 10, and believing the whole game was that exciting. I do get frustrated. There are hard days of practice. There have been times when I’ve wondered if I would be able to manage the two. However, having a strong foundation in my faith has truly helped me to remain rooted in being the leader that my family needs me to be. I have made a commitment to being the best wrestler in the world. It’s a commitment to maintain excellence, even when the hunger lessens and the fire of desire flickers. My wife Lauren comes from a wrestling background, having had three brothers that all wrestled at the Division One level, and a father who was their high school wrestling coach. She understands the intricacies of the sport, and always holds me accountable. My mission has become her mission, my goals hers. And because of this, her and Beacon travel with me to all of my domestic events. I wake up on my days of competition, in an unfamiliar bed, but with familiar faces lying next to me, reminding me of how blessed I am, and what I represent. Being a father is the ultimate privilege. God entrusted me, of all people, to lead, protect and provide for this beautiful baby boy and I feel honored because of it. One day when Beacon is becoming a man, and I’ve lost my athletic prowess, he will look back and wonder who his Dad was as a wrestler. The videos, trophies, and stories will be how my legacy will be remembered. God, family, and wrestling. Having a foundation in the first, will allow you to effectively balance the next two. In the end, I would like to exemplify hard work and leadership for my son to follow. It may be difficult, but it’s the hardest job you’ll ever love. What happens when life collides with wrestling? My son Beacon was born two weeks early on July 19th, 2014 at 9:01 am. Dad made it just in time. Beacon’s original due date was August 3rd. In preparation for the World Championships, our national team usually chooses a tournament in late July or early August to compete in as a tune-up event. The scheduled competition was the Gold Grand Prix in Baku, Azerbaijan, but the event would fall within the pregnancy two week grace period, when doctors recommended that both parents remain home in preparation for the baby’s arrival. Basically, if I hoped to be present for the birth of my first child, I better stay home. Decisions decisions. There weren’t many other tournaments to choose from, other than the Pan-American Championships in Mexico City, Mexico on July 17th. That should’ve given me plenty of time to train, compete, and make it home to be ready for the baby’s birth. Or at least I thought. After competing on the 17th, I had a long trip back from Mexico to my home in Lincoln, Nebraska. I landed around 8 p.m. on Friday the 18th, very thankful that I had the next couple of weeks of free time to enjoy with Lauren. But at 5:45 a.m. on Saturday morning, eight hours after I arrived home, Lauren’s water broke, and three hours later our first little guy arrived to the world. Wrestling and fatherhood had just avoided a head on collision. To say that balancing these two is a tough job is a definite understatement. 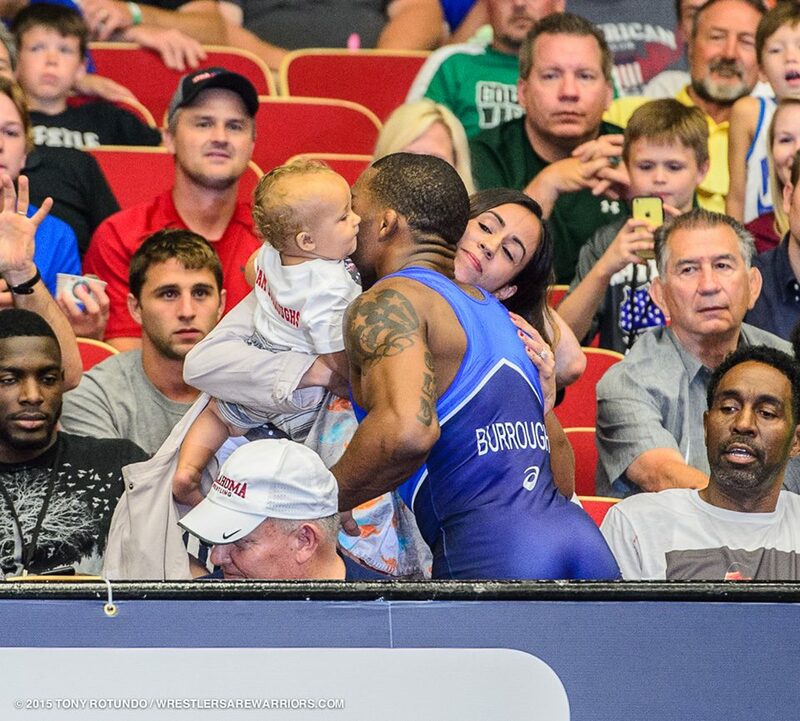 During the first two months of Beacon’s life, I spent roughly three weeks with him, as I prepared for the World Championships in Uzbekistan. Being a parent means sacrifice and many times, complete surrender of your own needs to the needs of your family. Not the grudging, or reluctant kind of surrender, but required from you is the joyful, selfless love necessary to maintain a happy home life. Of course there are things that I’ve lost as an athlete, that were once a staple in my training, but you learn to adjust. There were those wonderful afternoon naps between training sessions, that are now spent taking my little guy on walks or rolling around on our living room floor. There were the amazing uninterrupted nights of sleep, that are now spent settling down our little guy when he wants to ditch the crib and sleep between Mom and Dad. The recovery days that I used to spend sleeping in, are now disrupted by a little foot in the face, or Beacon climbing on my head, usually in desperate need of a diaper change. After being married in 2013, the dynamics of my life changed drastically. Two weeks after our wedding, we found out we were pregnant and life has continued to change since then. I recently had a chat with Lee Kemp that was very comforting and gave me tremendous insight to the delicate balance between family and wrestling. Lee was a three-time World Champion at 74 kilograms and a multiple-time NCAA Champion at Wisconsin. Lee told me, when you plan for something, you adjust accordingly, and make the fundamental sacrifices to ensure that your family is well taken care of. As much as we have a passion for wrestling, at this level it is every bit of an occupation. Typical working dads spend time away from their children too. There is the normal work day, which sometimes includes business trips, or even more time at work than we spend training. But being a parent shouldn’t affect their ability to do their job, and to do it well. So why should it affect yours? You do what you have to do, and you can excel at both. It was great advice. There have been plenty of instances throughout my time as a parent, when I’ve had to pray for patience and enough energy to get through a long day. The realism of life is that it’s not easy, it doesn’t ever slow down, and at times it can be chaotic. Throw in a tough day of practice, and it could be a recipe for disaster. If you follow me on social media, the positivity and big smile on my son’s face in pictures is not always a realistic depiction of everyday life. Those are just the highlights. It’s like watching the ESPN Top 10, and believing the whole game was that exciting. I do get frustrated. There are hard days of practice. There have been times when I’ve wondered if I would be able to manage the two. However, having a strong foundation in my faith has truly helped me to remain rooted in being the leader that my family needs me to be. I have made a commitment to being the best wrestler in the world. It’s a commitment to maintain excellence, even when the hunger lessens and the fire of desire flickers. My wife Lauren comes from a wrestling background, having had three brothers that all wrestled at the Division One level, and a father who was their high school wrestling coach. She understands the intricacies of the sport, and always holds me accountable. My mission has become her mission, my goals hers. And because of this, her and Beacon travel with me to all of my domestic events. I wake up on my days of competition, in an unfamiliar bed, but with familiar faces lying next to me, reminding me of how blessed I am, and what I represent. Being a father is the ultimate privilege. God entrusted me, of all people, to lead, protect and provide for this beautiful baby boy and I feel honored because of it.